Hip arthroscopy is a procedure that allows the hip specialist to examine (and at the same time treat) the bones, ligaments and cartilage of the hip joint. Hip arthroscopy is performed as minimally invasive surgery, small incisions allow microsurgical instruments to enter the hip joint. Hip arthroscopy can identify (and often remove) the causes of osteoarthritis of the hip. The arthroscopic camera enables the surgeon to see the interior of the hip, fluid is injected into the joint space to enlarge the space for the surgical procedure. 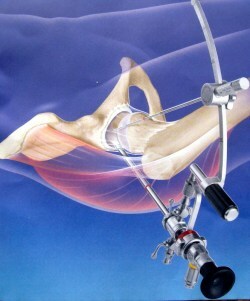 Arthroscopic tools are used to repair damage to the hip and prevent osteoarthritis progressing. Hip arthroscopy is an examination method and treatment for hip pain, at the same time. After hip arthroscopy the incisions are closed with sutures. Wound healing is quick due to the fact that the incisions are so small. Hip Arthroscopy - Why do we do it? Hip arthroscopy is performed as preventive maintenance on a hip joint that has started to cause pain. Hip arthroscopy is used before the articular cartilage and bony structures of the hip joint exhibit irreparable harm. It allows the surgeon to "catch" the cause of the problem early and thereby preventing (or at least postponing the need for more invasive hip surgery). One of the most important factors for the success of hip arthroscopy is the experience of and the process followed by the orthopaedic surgeon. Dr Schneider, as head of the hip department at the orthopaedic Gelenk-Klinik, has been practicing hip arthroscopy since 2004 and is recognised as being one of the most experienced specialists in hip preserving surgery. Performing between 200 and 250 per year, hip arthroscopy makes up an important part of Dr Schneiders surgical programme. The success of hip arthroscopy depends on what is found to be causing the constant hip pain during the arthroscopic examination. The results for hip preserving arthroscopy are particularly encouraging in younger patients, as in these patients, very often the damage to the hip joint is not yet advanced. In cases of more advanced osteoarthritis of the hip, arthroscopic surgery may no longer be able to save the hip joint. However it can provide temporary relief and together with rehabilitation treatment and physiotherapy, has the potential to delay the need for hip replacement surgery, by up to two years. If hip pain is explained as primary osteoarthritis, it usually means that the orthopaedic doctor has not yet been able to find the reason for the painful arthrosis of your hip. The treatment of primary hip osteoarthritis is usually limited to the prescription of analgesics (pain killers) and monitoring the effect on the pain. In time, when the pain becomes unbearable, and immobility of the hip is too far advanced, prothesis surgery is normally recommended. However, during the last decade, leading centres in hip surgery have developed a deeper understanding of the real causes of hip arthritis. These insights have offered the chance to understand and treat hip osteoarthritis earlier, thus preventing the arthritic degeneration of the hip joint. Loose bodies are cartilage and bone particles. They might occur in the joint fluid after injury or for no particular reason. These loose bodies increase friction, provoke inflammatory pain and cause degeneration of articular cartilage in the hip joint. Loose bodies in the joint fluid and damage to the cartilage can be removed by hip arthroscopy. The original liquid inside the hip joint is replaced (joint lavage), permanently removing all particles. Bone spurs are benign growths of bone tissue. These bone spurs have the potential to inhibit the free mobility of the hip. The bone spurs can also scratch the cartilage surface of the hip, contributing to degeneration of the hip joint. Most of the time, bone spurs are caused by impingement of the hip joint: when bones such as the femoral neck collide frequently with the socket of the hip, these collisions can provoke the growth of bone spurs. This happens frequently in the hip joints of athletes and gymnasts. Deformities of the hip joint - either congenital, or acquired by juvenile athletes, can cause hip impingement and result in bone spurs. The hip specialist can shave these cartilage- damaging bone spurs off using the arthroscopic approach. Around the cup of the hip joint, a ring of fibrocartilage (fibrous cartilage) surrounds the edge of the articular (joint) surface, forming part of the articular surface. 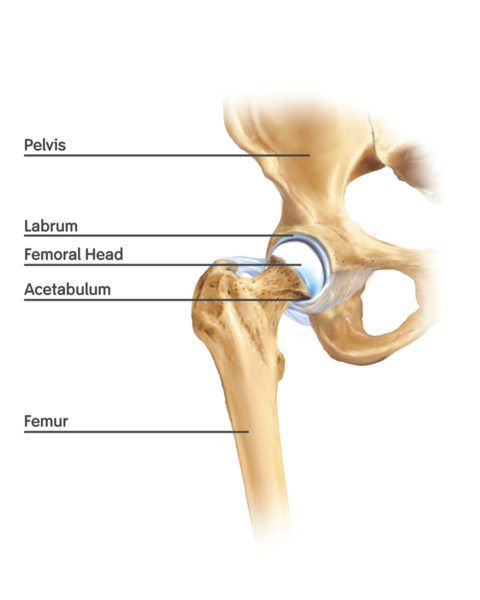 This acetabular labrum of the hip is a sensitive structure that can break or tear during accident or injury. Often athletes suffer a labrum tear when they fall on the hip. This tear can be painful, however often, it goes unnoticed until chronic hip pain develops later. A damaged labrum can contribute to the rapid degeneration of the hip cartilage. However hip arthroscopy can directly inspect tears of the labrum and these tears can be trimmed or smoothed out. A hip specialist can also repair the labrum of the hip by suture. CAM-Impingement: A bony protrusion on the femoral neck can interfere with the socket of the hip joint. Shaving or removing these obstructions, can free the joint again. 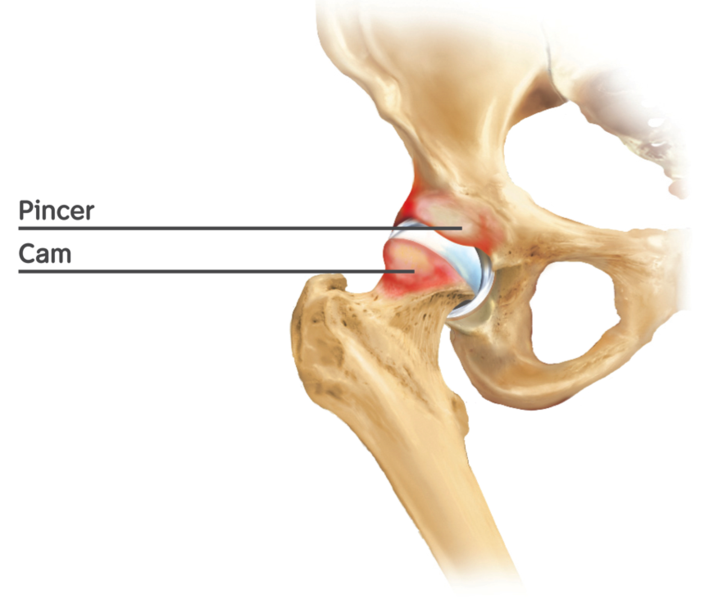 Pincer impingement: If the socket of the hip joint is too deep or badly orientated, mobility of the hip may be blocked by impingement. Deformity of the femoral head: If the head of the hip joint is not completely spherical, or does not match the size of the hip socket, the repeated (mismatched) contact can also cause the growth of bone spurs. Full weight bearing on the joint is permitted the day after surgery. The patient may leave the hospital the second day following surgery. Wound healing is not a concern as the surgery is minimally invasive (there are only two cuts of approximately 1,5-2cm in length). Complete rehabilitation depends on the exact nature of the repair, but return to the workplace can normally take place immediately. Impact activities such as skiing, jogging or competitive sports, are usually not allowed for a minimum of three months. Contact sports (karate, football) are discouraged for four months after a hip arthroscopy.